Bring Pirate Fishing Vessels out of the Shadows! Just this week, EJF has been documenting the illegal activities of an industrial trawler, destructively bottom-trawling within the Inshore Exclusion Zone (IEZ) of Sierra Leone in West Africa. 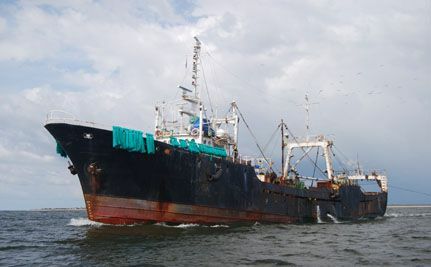 As with many illegal vessels, it was hiding its identity by covering its name with fishing nets and it is unclear what flag the vessel is flying. We have seen this vessel before so we know its name, but ownership information is hard to come by; according to our investigations, the company listed by a shipping website as owning the vessel doesn't even exist! The current lack of transparency means that it is very difficult to trace fishing vessels as they change their names and their flags to avoid detection and sanctions. "Pirate fishing operators" steal with impunity and devastate marine environments, often using banned fishing gears, targeting protected species and fishing with high levels of bycatch - the accidental capture of species including seabirds, sharks, turtles and other endangered wildlife. Without a Global Record of Fishing Vessels, it's difficult to identify offending vessels and even harder to penalize the true owners. This important step would bring much needed transparency and accountability to the oceans, providing a clearer picture of vessel ownership, their histories and the size and capacity of each country's fleet.